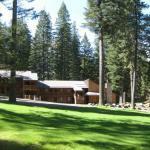 This resort is located at the southern end of Wallowa Lake just 8 minutes' drive from the centre of Joseph Oregon. A seasonal outdoor pool and hot tub are located on site. Free Wi-Fi access is provided. Wallowa Lake State Park is 1.6 km away. A cable TV and a seating area are provided in each of the accommodations at Eagle Cap Chalets. En suite bathrooms come with free toiletries. Select accommodations include fully equipped kitchens and BBQ facilities with kitchenware. Meeting facilities a snack bar and vending machines with drinks are just some of the facilities available here. An array of activities can be enjoyed on site or in the surroundings including a seasonal miniature golf course and hiking. The Wallowa River and Mt. Howard are within 3.2 km away from this resort. Stubborn Mule Saloon & Steak Outlaw Restaurant and Embers Brewhouse are within 8 km away. The property offers free guest parking.